We could very easily define tape technology as the grandfather of a modern days DAW. Where today our weapon is a tap or a slide of the trackpad yesterday’s most useful tools were scissors and adhesive ribbon. But aside from the hassle of physically editing music recorded on magnetic reels the medium offered many perks, even according to today’s standards. The particular sonic transformation that occurred when using tape machines gave something special to the music. Some call this sound analog warmth, and can’t easily pinpoint what elements contribute to obtain it. Some other believe it is generated by a combination of equalization, compression and saturation typically transferred to the audio by reel-to-reel machines. The time of tape machines as primary platform to record and edit music is long gone but the search for their warm sound is still here and I suspect it’s going to stick around for a while! 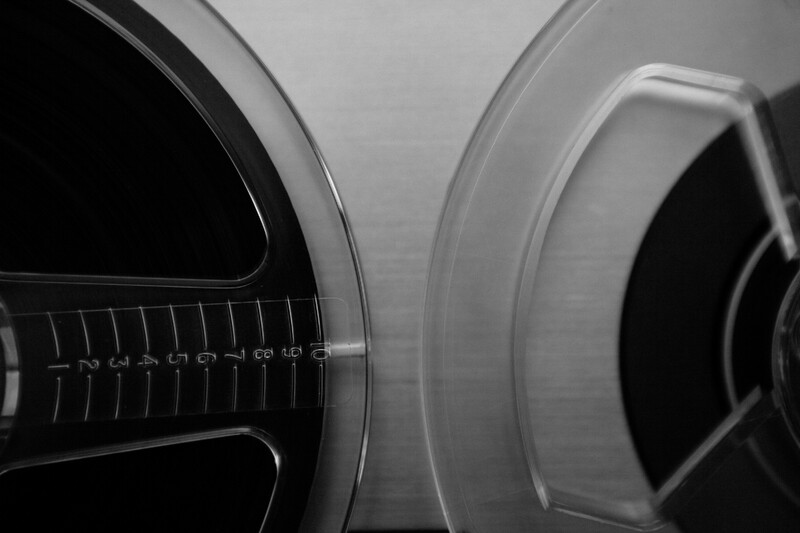 Find out more about the the reel history of tape machines. Before you start adding some magnetic magic on your music you might also want to bookmark this useful list of common tape machines’ settings. Let’s face it, along with the many improvements in the life of a modern composer technology brought an uninvited guest: coldness. Digital perfection can sometimes translate as unpleasant/inauthentic to the ear. I fight coldness on a daily basis when trying to impart some humanity in my orchestral mock-ups and am always on the lookout for ways to reduce it. So how do we harness the analogue warmth of reel-to-reel machines without giving up our cutting-edge technology? Let’s start with an easy one: add noise. Find a free to use tape noise recording and add it to your track. Not only this is a no-brainer but it is also a cheap solution. What’s that? You don’t know where to look for it? Fear not, the awesome people of MusicRadar have you covered! If you want to add the warmth of reel recording to your music but do not feel spending too much time fiddling with complex parameters you could choose to use samples that are already processed with tape. I really like Loopscape by Rhythmic Robot Audio, and have also heard some nice demos of Soundiron Tape, both of which run on Kontakt. Some software/plug-ins have tape simulation modules built-in. Meaning you might already have the tools! Izotope Ozone, for instance, has a great Vintage Tape module that does not activate when using the automated services but is there for you when you need it. It gives you several options but is fairly easy to setup. Another two I have heard great things about are the Logic Tape Delay module and Cubase’s Magneto III. I haven’t tried them as I am a convinced Digital Performer user but if you are on Logic or Cubase give them a try and let me know how it goes! Be sure you check your existing plug-in library for some gem might be there waiting for you to find. There is a category of plug-ins whose sole function is to simulate the effect of tape machines. They are generally full-fledged virtual copies of their analogue counterparts. As such setting them up might require a bit of experience. As their number is rather large, and ultimately we can all have slightly different tastes, it is difficult to highlight the best. Nevertheless I’ll point to you a few that I like and I invite you to do some research to find many more. First of all you should check this free plugin suite from developer CDSoundMaster, available on mac and pc! Next a couple of very popular ones: Softube Tape and Studer A800 Multichannel Tape Recorder plug-in. Lastly one that is not very famous but is inexpensive and has great potential: AudioRhing Reels. It might not be the most practical (or inexpensive) solution but you always have the option of running your music through a real reel-to-reel machine. This process involves routing your DAW output to a physical machine input, recording the track on tape, playing it back while recording the machine’s output back in your DAW. So first up you’d need some hardware. Here is a great article on SOS that will help you in your quest of buying a good used tape machine. Do you think using a real tape machine is the only way but don’t care too much for the complicated process? Good thing you live in an era where the word automation is quickly catching up with the word application in the everyday vocabulary. Enter the world of CLASP (Closed Loop Analog Signal Processor). Once you connect this magic box to your DAW you can integrate real analogue tape recording into your DAW signal and workflow, controlling everything from an app. With a starting price point of just under $4000 (tape machine not included) this is a solution for the serious analogue warmth chaser only. Cassette technology is living a renaissance and is here to save the day once again. You could either do some experimentation with your dusty Walkman or follow this method. It involves a regular cassette player and a cheap tape-to-CD-adapter. Alternatively why not asking someone to run your music through their studio-grade gear? You can get 3 tracks done for 5$ on fiverr. Whether you use subtle effect with software plug-ins or run your entire mix through an actual tape machine there are many advantages of transforming your sound with this resilient technology, give it a try and let me know how it goes! See you soon for another trip back to the future!